A vehicle’s engine runs on a specific temperature. This temperature needs to be maintained otherwise the engine can stall and refuse to start up. The water pump plays an important role in the healthy functioning of the engine. The pump regulates the amount of coolant that goes into the engine. Its job is to constantly supply the engine with fresh and cool liquid from the radiator so the engine can work properly. However, when the water pump fails, and they do regularly fail, the engine will not be able to get the correct amount of coolant and will heat up. That’s just how water-cooled engines work if there is no water, the engine cannot survive. Therefore, a properly functioning water pump is vital. When it fails a few symptoms arise which alert you to go to the mechanic to ensure the proper health of the engine. The symptoms of a failing water pump will tell you whether to visit a mechanic or not. The water pump comprises a number of gaskets that ensure the coolant stays sealed and that the flow of water is uninterrupted. However, with time these gaskets can deteriorate and become completely useless causing the coolant to leak out from under the water pump. If you have a puddle of water or coolant below the front end of your car, you are probably looking at water pump failure and so you need to go to a mechanic. There is a belt placed near the water pump that runs in tandem with the engine. If the water pump is failing this belt will start making a weird whining noise, which sounds something like a squeak. The loose belt is caused because the bearings in the water pump wear out. If this happens you are looking at a complete replacement of the water pump rather than repair. The primary job of the water pump is to supply the car’s engine with adequate water and that too constantly. If the water pump fails somehow, you will see the temperature gauge rising in the dashboard. This can happen due to a number of reasons such as thermostat failure or short electrical wiring but you should always get it checked out by a certified mechanic. Otherwise, you are looking at widespread damage to the head gasket, the cylinders, and pistons. All of which can reduce the overall life of your engine. If you see white smoke coming out of your radiator, you are looking at clear signs of water pump failure. The steam in the radiator is produced from an overheated engine, which can happen if the water pump is not working perfectly. When faced with this problem, it is better to stay safe and stop driving, wait for the engine to cool down and try to reach your mechanic. Solving water pump failure is not an easy task. Even though this part is small it requires expert care for proper repair. Therefore, take your car to the mechanic to get your issues sorted out. Maybe the water pump hasn’t failed yet but it is on its way towards failure. This would mean that the water pump is functioning but it is not functioning up to its mark. In such a case, the engine will not be getting enough coolant circulated into the coolant chamber and it will heat up. This can be avoided by using top-grade coolant. If you are using sub-standard coolant it will not only cause problems in your engine but it won’t cool down the engine too. You can also try to bleed your coolant system. When it comes to the water pump, you should know that it is very often not easily repaired. Gaskets are sheets of metal that can act as a barrier between opposing liquids like water and oil. These gaskets can shatter or blow over time and need replacement. When the water pump fails, gaskets are the first thing your mechanic will look at and the first things he will change. Furthermore, if your water pump is electronically operated, your mechanic might have to check for electronic failures. If they existing, the repair will be short and snappy. However, there is one thing that when it goes bad cannot be repaired and that is the water pump bearings. If the bearings in a water pump deteriorate, the water pump will have to be changed entirely. The water pump is often driven by the timing belt, in these cases, the labor cost will be a lot more because you have to remove and often replace the timing belt when you are replacing the water pump. Most often the water pump is replaced with the timing belt replacement for cars like Volkswagen, Audi, Skoda, Seat. 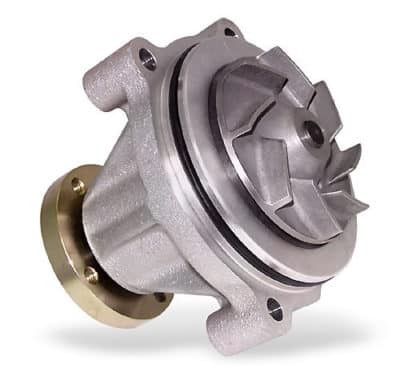 A water pump is not expensive but it is not very cheap either, which means you would easily have to spend $100 to $200 for a spare water pump. The cost of the water pump is directly related to the make and model of your vehicle. If your car has a bigger engine, it will need more coolant to flow inside and hence your car will need a bigger water pump. Furthermore, the cost of the water pump will be affected by its availability in the market. When a spare part is very rare in the market its prices are high but when it is easily available you won’t need to pay much. However, you won’t be able to get away with paying less for the work required to remove and replace a water pump is a bit hectic. Your mechanic would have to work very hard to remove the water pump from the engine and for that, he might charge you exorbitant rates. You could expect labor costs equaling $150 – $300 or more. i am driving a 2 litre toyota condor 2003 model. the problem is that it breaks the water pump while the car is in motion, did that for the second time after replacing new water pump, new radiator and new fan blade. What do you mean with breaks the water pump? How far can you drive before it brakes? If the water pump is driven by the serpentine belt, make sure that you don’t tighten it too hard!